During the conference Chemnitzer Linux-Tage, you will have the opportunity to take an exam which is needed to become a Certified TYPO3 Integrator. The exam will take place on 15 March 2009. The "TYPO3 integrator" develops the template for a website, configures all the necessary extensions and creates the access rights for backend users. The "TYPO3 integrator" does not install TYPO3 on the webserver and does not programm extensions. The "TYPO3 integrator" knows how to configure the preinstalled TYPO3 by using the installer. 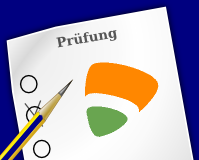 The TYPO3 certification exam is a paper based multiple choice test. The exam consists of 70-90 questions which have to be answered within 90 minutes. Further information is available at http://certification.typo3.org/. All attendees have to register for the exam in advance. After having registered, you will be informed about the acceptance of your registration within the next 7-14 days. As an exam candidate you will need to bring an identification card to the exam. Furthermore, the exam fee of 150€ (members of TYPO3 Association) or 200€ cash has to be discharged. Please have the exact amount money ready- we will not be able to change. Before you can start with the exam, you will have to sign the "non-disclore and banner usage agreement"NDA. You do not have to bring the signed NDA to the exam - we will provide the NDA so that you can sign it before taking the exam. This agreement is created to protect your certification and help maintain the integrity of TYPO3 certification program. Make sure to be at the location 15 minutes before the test actually starts. The exam will take place on Sunday, 15 March, in the basement room UG2 at 10.30am.